If so, the Gentle Leader collar will be one of the best dog training collars you can get. It not only addresses leash pulling, it also helps with lunging, jumping, barking, mouthing/biting, fear and shyness. At just four months old, my German Shepherd puppy pulled my boyfriend off of the front porch. He fell down three steps, resulting in a fractured foot. Night and Day. That was the difference. The gentle leader head collar really works! Not only did she stop pulling, but she nipped a lot less and appeared more secure. Even on crutches, he was able to handle her with no problem at all. Teething puppies tend to mouth or bite. She never tried to cause pain, but puppy teeth are so sharp! SHe slowly stopped nipping and now, she doesn't nip at all. And she's always been a bit shy. But now, instead of walking with her tail hanging down, she trots around with her tail up in the air. The gentle leader dog collar allows you to communicate with your dog in her language - dog body language. The neck strap puts pressure on the back of the neck versus the front of the throat with traditional dog training collars. This works much better with your dog's "opposition reflex." Dogs have a natural instinct to push against pressure. This is why your dog will continue to pull even while choking on a standard dog collar. The gentle leader harness places 80% of the pressure on the back of the neck. Instinctively, your dog will lean back against the pressure. The nose strap serves as a reminder that you are in charge. 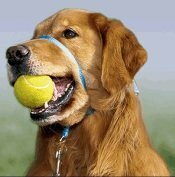 It firmly but gently encircles the muzzle the same way a pack leader would hold a subordinate's snout. Dogs are pack animals and need a firm but gentle leader. 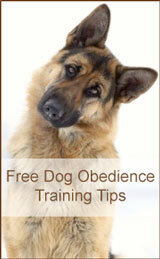 Gentle leader dog training collars will reinforce the fact that you are the leader. And this knowledge gives them security. Shy, nervous and fearful dogs will actually relax and gain greater confidence. It takes very little strength to direct a large animal by the head. Think of the way a halter works on a horse. If your dog pulls ahead, simply hold the leash firmly. The gentle leader harness will turn your dog's head back towards you. A Proper Fit is Crucial! If possible, have your trainer fit your dog for the gentle leader collar. It comes with a very informative DVD. Watch it. Also, read and understand the enclosed information sheet. If it is not applied correctly, you will see excessive pawing and great resistance. It may also chafe your dog's nose. The neck strap should be high at the back of the neck and fit snug. You should barely be able to get one finger underneath. This will prevent rotation of both the next strap and the nose strap. If the nose strap rotates, it may chafe your dog's skin. Make sure the nose loop of the gentle leader collar is loose and comfortable. It should move freely between the end of your dog's nose to just in front of her eyes. If you've ever seen Cesar Millan walk a dog, you have seen the way he places the collar very high on the neck. I've never seen a dog pull on the leash or walk in front of him. Your dog should walk either next to you or behind you. Never in front. Common resistance actions are pawing at the Nose Loop, rolling around on the ground or standing up on her hind legs. Usually, the dogs that benefit most are the ones that resist the most. Don't reinforce unwanted behavior by comforting your dog while she is resisting. Reward the behavior you want by treating or praising her when she ignores the new sensation. Tension on the leash is a clear signal to your dog that she is doing something wrong. As soon as the dog does what you want, release ALL pressure. Your dog will interpret no tension on the leash as a sign that she is doing what you want her to do. If your dog is walking calmly or sitting quietly, immediately release any pull on the leash. Otherwise, you may confuse your dog. My dog no longer pulls on the leash, has cut way down on nipping, and she just looks like a happier dog. The only thing I don't like about the gentle leader collar is that it makes me a little nervous to see a strap so close to my dog's eyes. It is properly fitted, so it won't go anywhere, but the jittery parent in me doesn't like anything so close to her eyes. But, there is an option to wear the neck harness without the Nose Loop. The Nose Loop can be worn when more control is needed. I plan to slowly introduce this option into my puppy obedience training. If you're looking for training collars, try the dog gentle leader collar. The changes I've seen in my dog are just wonderful. And to think... it all began with a broken foot.